How Tall is Counter Height? Labels for Tables: How Tall is Counter Height? When it comes to dining room furniture, there are three main table heights: standard tables, counter height, and pub or bar height. Recently customers in store have been asking: how tall is counter height? Here’s the breakdown: A standard table height is between 28 inches and 30 inches. A counter height table is between 35 inches and 39 inches. A bar or pub height is 41 inches to 43 inches. Most of the pub and counter height tables for sale at American Freight are 36 to 41 inches. While they’ve been overshadowed by traditional styles in the past, counter height tables have recently been a hot home trend. Their popularity is due to a few reasons. First, they can fit in smaller spaces than a regular kitchen table. They are able to fit in an eat-in kitchen space or breakfast nook. Therefore, you can forgo a kitchen table centerpiece if you’re lacking room. Another space-saving solution is to push a counter height dinette against a wall or counter and use only two chairs to save space. For other ideas for small spaces, like small living room ideas, click here. Check out more Spring trends by clicking here. In addition, standard table heights are traditional and sometimes formal. Pub sets and counter height table sets are more fun, and made for casual dining, which is preferable to many people. If you think about sitting on a bar stool, your feet dangle and you lean up against the table from a higher perch to eat or have a drink. This is the definition of casual dining. Finally, it’s only the tabletop that’s higher on these sets, and not the price! Counter height tables are as affordable as they are functional. So, read on to see some of our featured favorites starting at just $298 for a five piece pub set! This simple, timeless dark brown table set is classic and affordable. It comes with a square counter height table and four matching chairs. Because of the added foot bars and criss-crossed chair backs, you will enjoy additional comfort. Click here to read a recent Tuesday Teaser with even more info about the Theo. 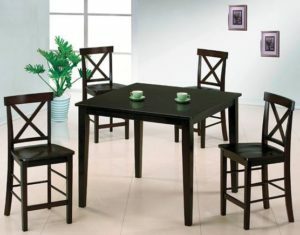 Get this five piece counter height dining set for just $298. This unique dining set is finished in a dark brown espresso color. It features a square table with sides that fold up around the edges to make it round. It also offers storage with a built in wine rack, and a Lazy Susan in the center of the table. Four matching, cushioned chairs are upholstered in a black leather-like fabric for a touch of added comfort and class. 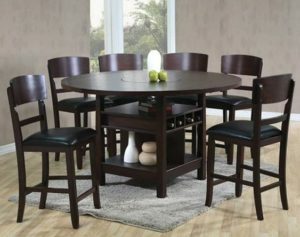 Get this 5 piece dinette for just $698. Click here to go to the product page. The Ridgewood five piece entertainment bar mixes rustic with industrial. 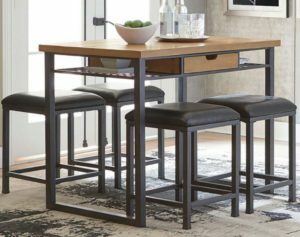 This piece of modern art is a two-toned counter height dining set with an antique black metal finished base and a distressed, reclaimed light wood finished table top. Furthermore, the four upholstered square stools offer casual, pub style seating. The central metal storage shelf with drawer space offers a charming combination of style and functionality. Hide unsightly kitchen items, or keep your tea and coffee supplies right at the table! Get this five piece dining set for just $498. Click here to go to the product page. So just how tall is counter height? This type of table ranges from 35 to 39 inches. Most of the American Freight counter height tables are around 36 inches, but can vary by location. Come visit us today to see our selection for yourself! Click here to find your local store. 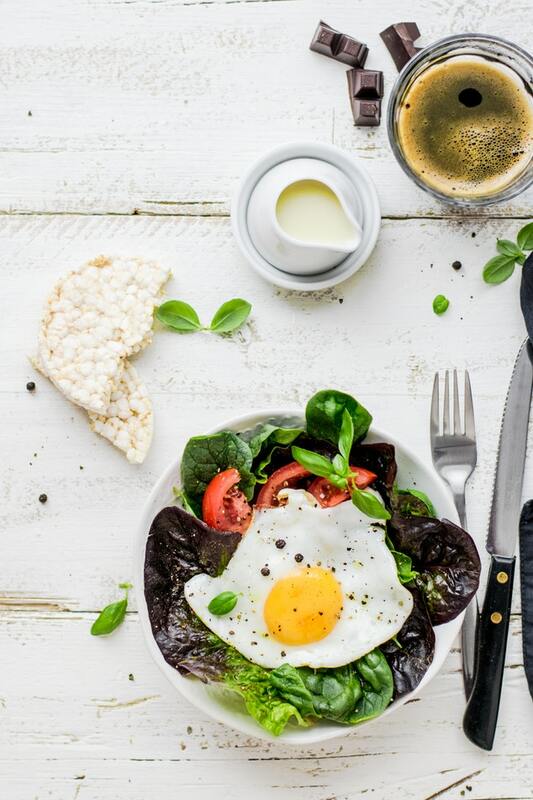 Did you love this blog post? Click here to sign up to receive a weekly email with tips, tricks and trends just like these that you can actually use around your home! Also, we’d love to hear from you in the comments below if you have any topics you’d love to learn more about.